The Atlanta group shares two new renditions of their songs “A W O L” and “Punchanella,” as part of the YouTube Music Foundry program. EarthGang, the kaleidoscopic Atlanta rap duo comprised of Johnny Venus and Doc Doctur, released an excellent album called Stray With Rabies last year. Today, they share live renditions of two of that album's songs — "Punchanella," produced by DrewsThatDude, and "A W O L," produced by J.U.S.T.I.C.E. League — as part of YouTube Music Foundry, an artist development program that helps emerging artists grow their fanbase. "We linked up with some of our old brethren from SW Atlanta and some new brethren from the local spots to put a fresh spin some of our favorite pieces from the album," the group said of the live session videos, which were filmed at a YouTube Pop-Up Space in Nashville this September. "'Punchanella' is named after a classic children's game played in a circle, where they take turns entering the circle busting moves for everyone else to try and mock. 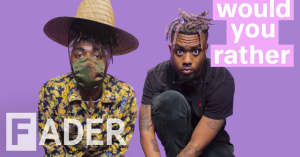 We made the song with the same free, rebellious vibe," EarthGang said. "'A W O L' gave us a chance to be more integral in the production process. We got in the studio with J.U.S.T.I.C.E. League, and crafted the song together."